Watch for updates in early November and in the next e-Newscast. Top: Two-dimensional GMOS spectrum of the strong emission line observed in the radio galaxy TGSS J1530+1049. The size of the emission region is a bit less than one arcsec. Bottom: One-dimensional profile of the observed emission line. The asymmetry indicates that the line is Lyman-α at redshift of z = 5.72, making TGSS J1530+1049 the most distant radio galaxy known to date. 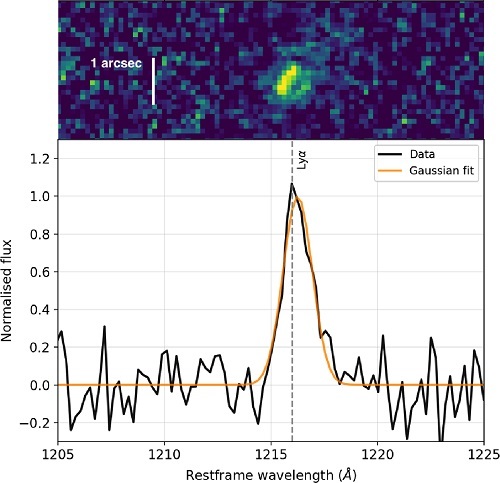 The team used spectroscopic data from the Gemini Multi-Object Spectrograph (GMOS-N) to measure a redshift of z = 5.72 for the radio galaxy identified as TGSS J1530+1049. This is the largest redshift of any known radio galaxy. The redshift of a galaxy tells astronomers its distance because galaxies at greater distances move away from us at higher speeds, and this motion causes the galaxy’s light to shift farther into the red. Because light has a finite speed and takes time to reach us, more distant galaxies are also seen at earlier times in the history of the Universe. The study was led by graduate students Aayush Saxena (Leiden Observatory, Netherlands) and Murilo Marinello (Observatório Nacional, Brazil), and the observations were obtained through Brazil’s participation in Gemini. “In the Gemini spectrum of TGSS J1530+1049, we found a single emission line of hydrogen, known as the Lyman alpha. The observed shift of this line allowed us to estimate the galaxy’s distance,” explains Marinello. The relatively small size of the radio emission region in TGSS J1530+1049 indicates that it is quite young, as expected at such early times. Thus, the galaxy is still in the process of assembling. The radio emission in this kind of galaxy is powered by a supermassive black hole that is sucking in material from the surrounding environment. This discovery of the most distant radio galaxy confirms that black holes can grow to enormous masses very quickly in the early Universe. The research has been published by Monthly Notices of the Royal Astronomical Society. An international team of astronomers led by Wes Fraser of Queen’s University in Belfast used CFHT and Gemini simultaneously to discover a new type of Kuiper Belt Object (KBO) called “Blue Binaries”. The wide separation and color of these cold classical Kuiper Belt objects are providing important clues on the early evolution of the solar system. 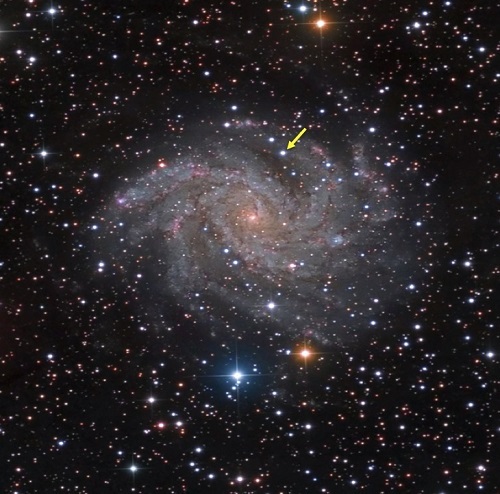 Their findings are published in the April 4 edition of Nature Astronomy. 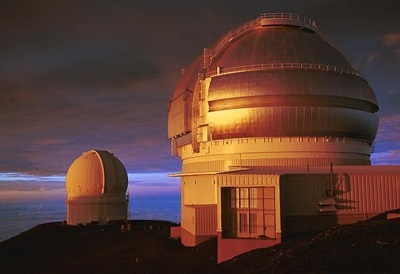 Simultaneous observing on Maunakea. Both telescope are pointing at the same object at the same time. Coordinating observations like this between two major observatories is quite a challenge but provides big returns. Credit: Gemini Observatory/AURA, photo by Joy Pollard. The Kuiper Belt is a circumstellar disk in the outer Solar System extending from beyond the orbit of Neptune to about 50 AU from the Sun. The dynamical structure of the classical Kuiper Belt is divided in two components. The hot component is made of objects with eccentric and highly inclined orbits. They have a broad range of colors and about 10% of them are binaries. On the other hand, the cold component consist of objects with nearly circular orbits and low inclination. Their colors are typically red and have a higher occurrence of binaries, about 30%. In February 2013, CFHT started the Outer Solar System Origins Survey (OSSOS), a Large Program that was awarded 560 hours of observing time over 4 years to find and track objects in the outer Solar System using Megaprime. OSSOS was completed in January 2017 and was highly successful, discovering nearly 1000 Trans Neptunian Objects that inhabit the outer Solar system. Five of the OSSOS objects are blue, very peculiar for objects belonging to the cold classical Kuiper Belt which are usually red. Additionally, these blue objects are wide binaries. The presence of so many widely separated blue binaries in the cold classical Kuiper Belt is difficult to explain. In their Nature paper, the team explored different mechanism that would lead to this configuration and estimated that the best model reproducing the observations is a “push out” by the early phases of the outward migration of Neptune. In order keep the binary systems intact i.e. not splitting them apart, the outward motion of Neptune had to be very smooth and eventless. “This research has opened the window to new aspects of understanding the early stages of planet growth. We now have a solid handle on how and where these blue binaries originated” said Wes Fraser, first author of the study. Nicole Arulanantham of Wesleyan University (Middletown CT, USA) led a team that targeted the binary T Tauri system known as V582 Mon (KH 15D) with the Gemini Near-InfraRed Spectrograph (GNIRS) on Gemini North. Arulanantham et al. obtained data at three different orientations of the system’s two young stars – allowing the team to study a number of key aspects of this complicated system. These included; characterising the photosphere and magnetosphere of the companion star (B), exploring a jet of material associated with a bipolar outflow, and probing the scattering properties of the circumbinary ring. 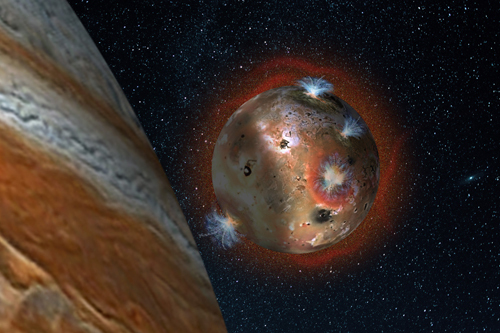 This led to the quantifying of an observed excess in near-infrared radiation that is likely the signature of a self-luminous hidden 10-Jupiter-mass protoplanet. While this unresolved planet displays the expected excess in infrared radiation, as well as a 2 micron spectral feature that may be due to methane or ammonia, other anticipated signs of these two compounds went undetected in the observations. 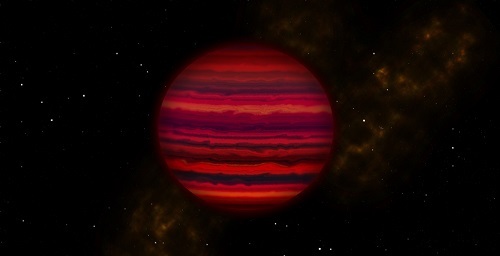 The team’s spectroscopic observations also revealed spectral features indicating a mixture of water and methane ice grains within the circumbinary ring where the frozen methane exists close enough to the primary stars that it must be shielded by dust from direct radiation. In addition to determining that star B is an early-K type subgiant, the research revealed evidence that star B’s magnetosphere experienced variable helium I emission due to ongoing mass accretion. The team’s paper is accepted for publication in The Astrophysical Journal. The preprint is available here. The top panel shows the spectrum of KH 15D during its “bright” phase, when the amount of direct starlight was greatest. The middle spectrum (“intermediate” phase) was taken when star B was just below the edge of the ring. 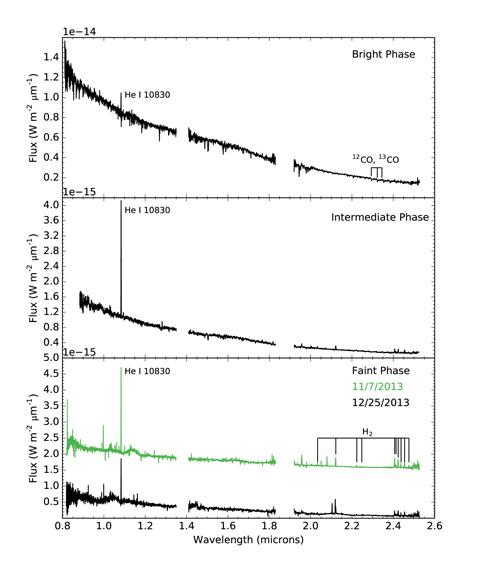 Both spectra in the bottom panel were obtained during “faint” phases from two different cycles, when both stars were near periastron and the contribution from starlight was minimized. The spectrum from November has been offset by 1.5×10^-15 W m^-2 μm^-1 for comparison to the data from December. The dark galaxy Dragonfly 44. The image on the left is a wide view of the galaxy taken with the Gemini North telescope using the Gemini Multi-Object Spectrograph (GMOS). The close-up on the right is from the same very deep image, revealing the large, elongated galaxy, and halo of spherical clusters of stars around the galaxy’s core, similar to the halo that surrounds our Milky Way Galaxy. Dragonfly 44 is very faint for its mass, and consists almost entirely of Dark Matter. Credit: Pieter van Dokkum, Roberto Abraham, Gemini; Sloan Digital Sky Survey. Using the world’s most powerful telescopes, an international team of astronomers has discovered a massive galaxy that consists almost entirely of Dark Matter. Using the W. M. Keck Observatory and the Gemini North telescope – both on Maunakea, Hawaii – the team found a galaxy whose mass is almost entirely Dark Matter. The findings are being published in The Astrophysical Journal Letters today. Even though it is relatively nearby, the galaxy, named Dragonfly 44, had been missed by astronomers for decades because it is very dim. It was discovered just last year when the Dragonfly Telephoto Array observed a region of the sky in the constellation Coma. Upon further scrutiny, the team realized the galaxy had to have more than meets the eye: it has so few stars that it quickly would be ripped apart unless something was holding it together. To determine the amount of Dark Matter in Dragonfly 44, astronomers used the DEIMOS instrument installed on Keck II to measure the velocities of stars for 33.5 hours over a period of six nights so they could determine the galaxy’s mass. 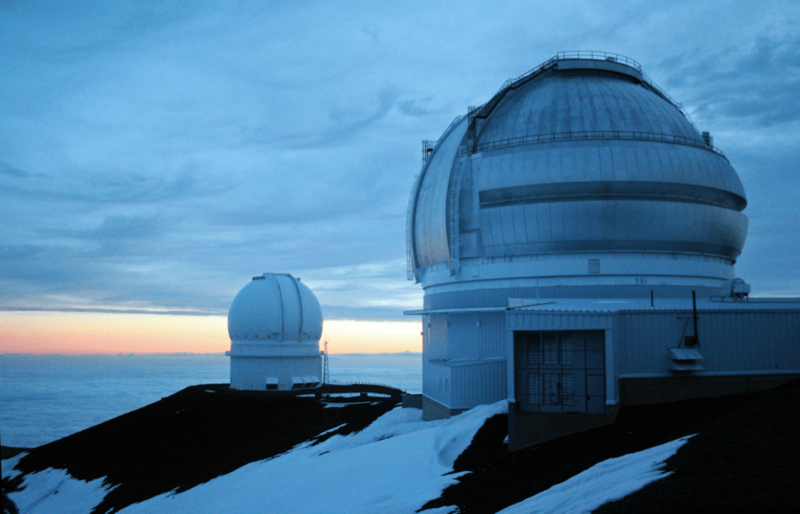 The team then used the Gemini Multi-Object Spectrograph (GMOS) on the 8-meter Gemini North telescope on Maunakea in Hawaii to reveal a halo of spherical clusters of stars around the galaxy’s core, similar to the halo that surrounds our Milky Way Galaxy. DEIMOS (DEep Imaging Multi-Object Spetrograph) boasts the largest field of view (16.7 arcmin by 5 arcmin) of any of the Keck Observatory instruments, and the largest number of pixels (64 Mpix). It is used primarily in its multi-object mode, obtaining simultaneous spectra of up to 130 galaxies or stars. Astronomers study fields of distant galaxies with DEIMOS, efficiently probing the most distant corners of the universe with high sensitivity. I wish I had the resources to attend Yale university.